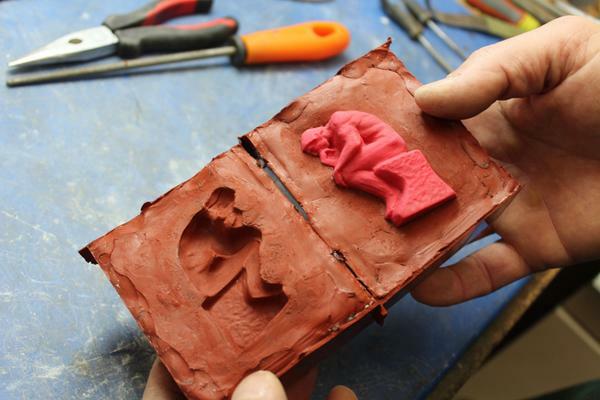 Casting is one of our projects in the metalwork conservation department and we have been making room temperature vulcanized (RTV) silicone moulds, sand casts and lost wax casts. 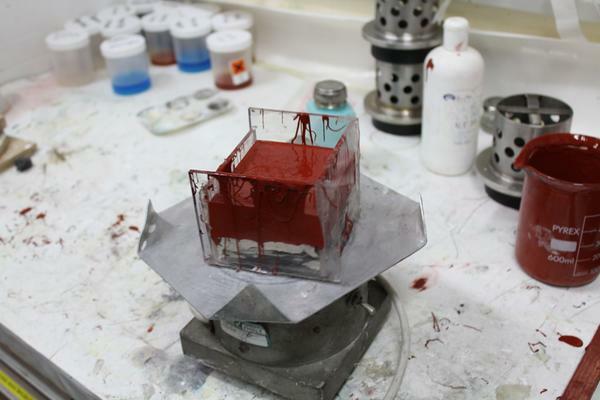 This post is about a casting side project using RTV silicone. 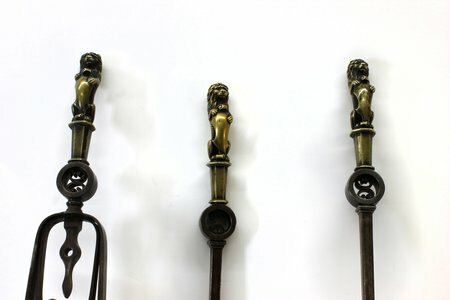 Each casting method is used for different purposes. RTV silicone moulds are usually used and ideal for small quantities such as in domestic, they are also low cost and can be done very easily. 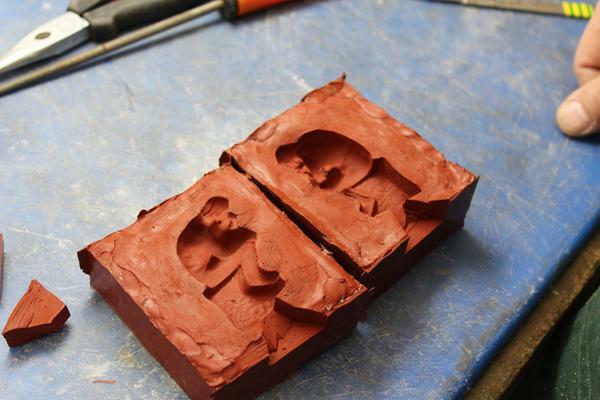 The other advantage of using silicone moulds is that moulds can produce complex shape and fine details. 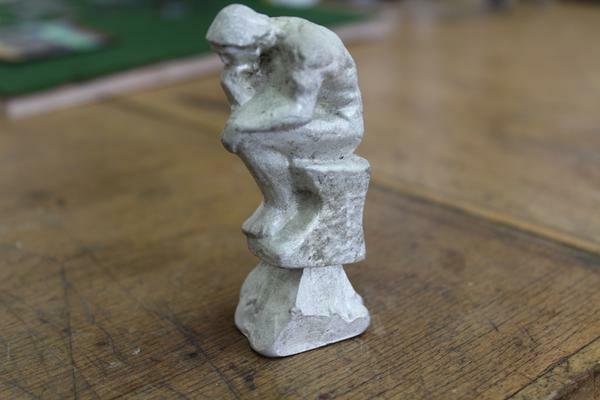 I found this eraser shaped like The Thinker in the Rodin museum shop in Paris during our recent study tour. Fellow metalwork student Rupert James and I decided to cast The Thinker in pewter using an RTV silicone mould. 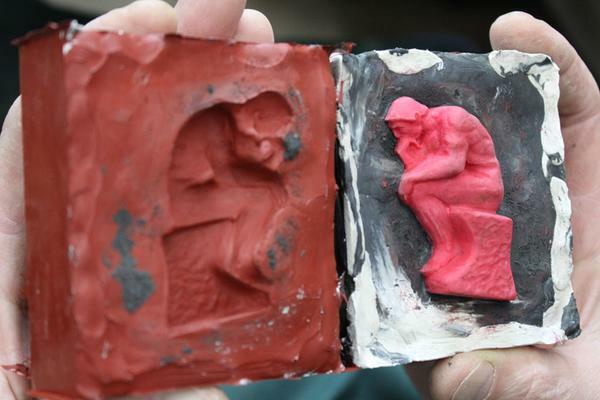 We placed The Thinker eraser onto plasticine, which was laid on a plastic board. We pressed the eraser half way into the plasticine. 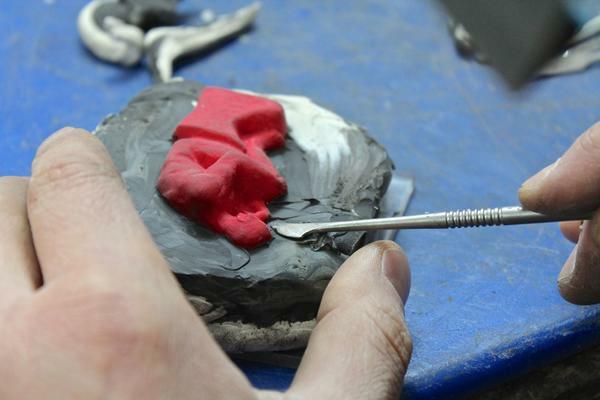 We added some more plasticine to fill the gaps, making sure the surface is flat and smooth. Once the eraser was buried half way in the plasticine, we set up surrounding clear acrylic boards and sealed edges with a hot glue gun. These walls need to be stable and avoid having gaps in between, so once the liquid silicon was poured in, it would not run out from the container. 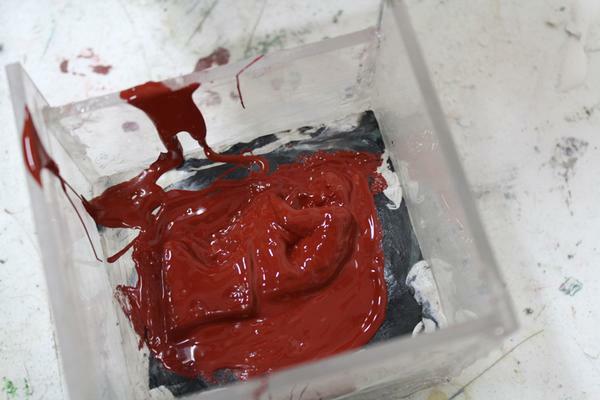 We mixed the RTV 101™ silicon from Alec Tiranti with catalyst curing agent 28. This catalyst is dibutyltin dilaurate, which cures (hardens) by increasing the rate of polymerisation of RTV 101, creating cross-links within the ingredients that help to solidify and provide strength and flexibility. By the instruction, the ratio is 6-8 drops of curing agent 28 for per 100g of RTV 101. 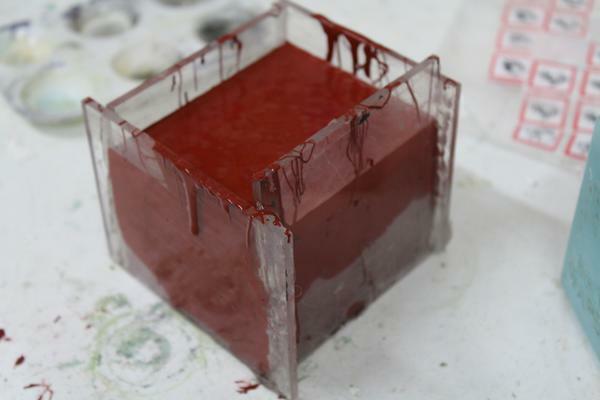 The amount of silicone rubber mixture needed for making this mould was 200ml, and for this amount 40 drops of curing agent was needed. It took approximately 12 hours at room temperature to cure. 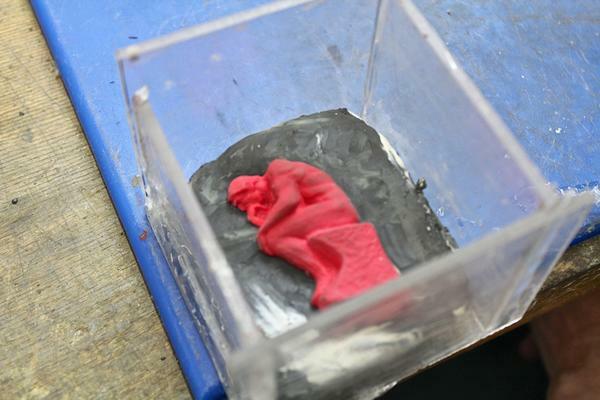 Before pouring all of the silicone, we used a brush to cover the eraser with a thin coat. This ensured every detail of the shape was covered. We then poured in the rest of RTV silicone and placed the mould container onto a vibrating plate for about two to three minutes. This was to take any bubbles out within the mould. Once done, we left it to set overnight. 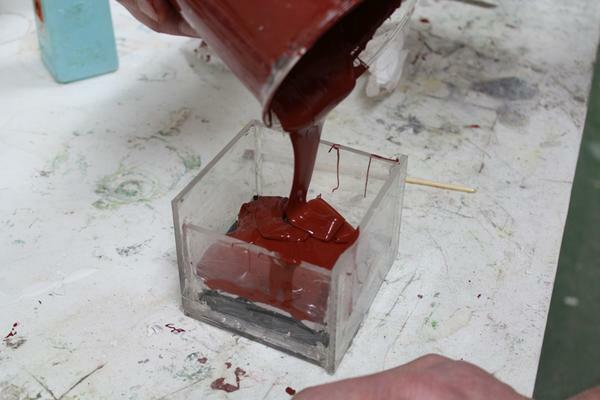 By the next morning, the first component of the RTV silicone mould was set. 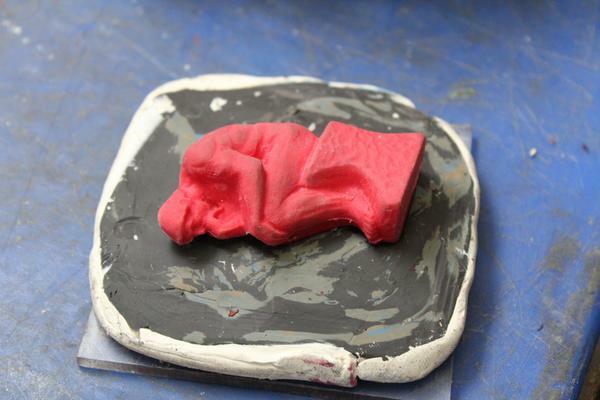 We then prepared the second side of the eraser for moulding, by brushing Vaseline™ over the object. This was to release the mould easily once the second part of it was set. 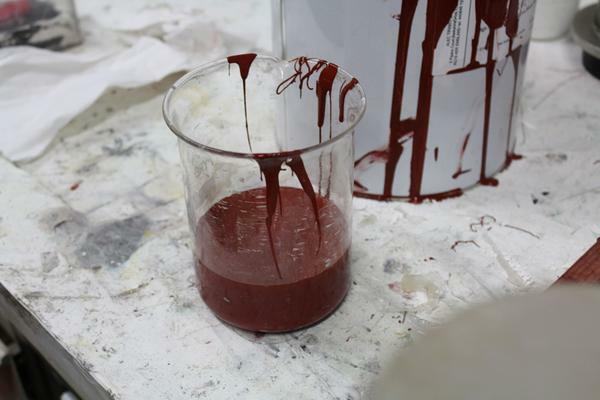 Then we poured a second 200ml batch of RTV silicone over the pattern. We removed any bubbles by gently tapping the container with a stick and placing it onto the vibrating plate. We then left it overnight. 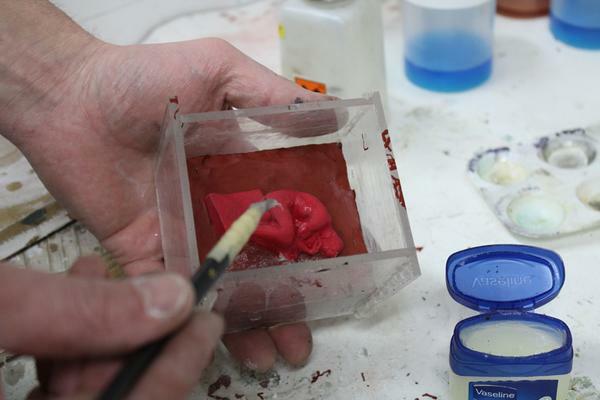 In the morning both component parts of the RTV silicone mould were successfully set, and ready for casting. We cut the bottom section of the moulds to create a sprue-this part is the pathway for the molten metal. We began the casting process by heating up the pewter, then pouring it into the sprue, and waiting for a few minutes until the pewter was solid. This mould halves were held tightly together with strong tape. 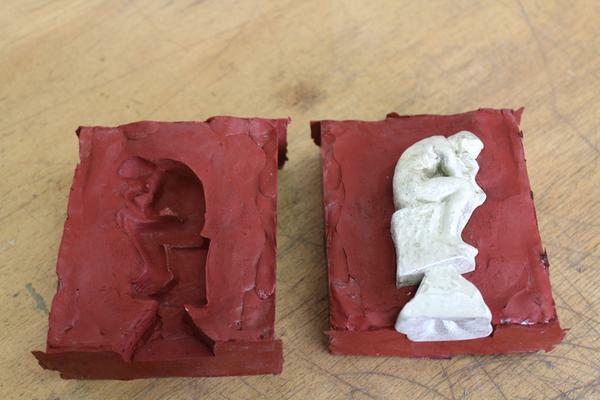 We removed the mould, leaving a successful pewter casting of The Thinker. 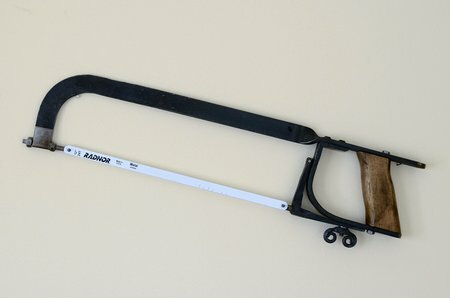 For futher finishing I will cut off the sprue with a hacksaw and file it, then polish and patinate the casting.